Standing on the sandy shores of Seattle’s Alki beach, the traditional summer grounds of the Dkhw’Duw’Absh (Duwamish) peoples, I watched in awe as waves of Coast Salish canoes made their way through the cold waters of the Puget Sound towards the beach front. 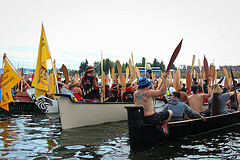 The historic Paddle to Seattle involved nine traditional ocean going cedar dugout canoes from coastal villages of Northwest Washington and Canada. 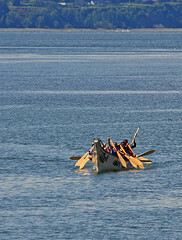 Following the 1989 event interest amongst other Coastal Nations grew and in 1993 the annual Tribal canoe journeys was born as Tribal Nations from the Northwest coasts of Washington, British Columbia and Alaska paddled from coastal village to coastal village sharing traditional songs and stories along the way. It was a beautiful and striking contrast to see the canoe families coming towards the shore with the Seattle skyline serving as a back drop. The imagery spoke volumes about the failures of Western society’s attempt to break the Indigenous spirit of the peoples. Traditional ways cannot be broken because buried in our DNA lays the prayers of our ancestors. It was clear to me watching their smiling, proud, and exhausted faces that the spirits of our Coast Salish relatives was most certainly alive. Awaiting the arrival of the canoes on the beach are members of the local tribal community to greet and welcome the visitors to their lands. Approaching canoe families would wait off shore and ask permission to come ashore. This tradition, now called protocol, requires canoe families to state who they are, where they come from and seek permission to enter the lands of host Tribal Nation all while their paddles are pointed up, a sign that they come peacefully. The annual canoe journeys, which now feature nearly 100 canoes, takes place every summer spanning the course of several weeks as canoe families depart from either their respective homelands, or some other predetermined location, and make their way to a final hosting Nations lands. The annual journeys now also include visiting Indigenous nations from beyond the coasts of Washington and British Columbia including the Maori, Native Hawaiians, as well as, the Ainu from Japan who participated in the Paddle to Neah Bay (Makah) a couple years ago. Joining the host Nation on the shores of Alki were scores of on-lookers both Native and non-Native. As the canoes were welcomed ashore the sight of several dozen canoes lining Alki beach, and still more canoes pulling to shore, pulled at the Lakota in me as I wanted to war whoop and yell “we’re coming to take our land back!”, but I too was a guest in their lands and instead said a wopila to canoe pullers for their efforts. This year’s tribal canoe journey returns to the lands of Emmett Oliver in the Paddle to Quinault: Honoring our Warriors, where more than 100 canoes are expected to land on August 1st. Once ashore visiting canoe families will partake in several days of feasting, sharing songs, and stories starting with those who traveled the farthest concluding with the host Nation. I was honored to stand on the shores of the Duwamish with my wakanyeja and bear witness to incredible spirit of our Coastal relatives. 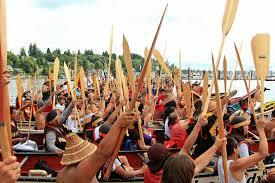 It was especially moving to see so many young canoe pullers arriving with each canoe. It made me proud to see the pride in them as they carried on the traditions of their ancestors who part took in these ways since time immemorial. This entry was posted in Healthy Lifestyle, News, Youth Wellness by lrinspire. Bookmark the permalink.